The Hawaii State Flag was adopted on December 29, 1845. The eight stripes of color stand for the eight islands. The only flag in the US with features borrowed from the United Kingdom is the Hawaii State Flag. The flag was adopted on December 29, 1845. It has been in use through the regimes of the kingdoms, protectorate, and after independence. However, some designs have been gradually altered. In a survey conducted by the North American Vexillological Association (NAVA), the Hawaii State flag ranked among the top flags in America and Canada in 11th position out of 72 flags. It is worth noting that between February 1893 and April 1893, the Hawaii kingdom was overthrown and the flag was slightly altered but it was restored in 1894. Notably, the governor of Hawaii has a flag which has two colors; red and blue and a circle of 8 stars with the word Hawaii in the middle. The Hawaii State flag is characterized by eight stripes that run horizontally with alternating colors of white, red, and blue from top to bottom. The eight stripes of color stand for the eight islands. The canton on the top right corner is borrowed from the British flag. In 1843, the stripes of colors were designed to equal length and breadth. The history of the Hawaii State flag dates back to the reign of King Kamehameha who was given a flag as a gift by an early explorer called George Vancouver. From then onwards, the king hoisted the flag and slowly people began identifying the kingdom with it. The king’s wise men advised him that the flag could lead to a suspicion that the kingdom was collaborating with the United Kingdom. The king was forced to lower the flag that was towering his palace in Kamakahonu. However, the flag was safely kept and influenced the later designs. The second most probable origin of the design was that during the 1812 war, the British soldiers forcefully planted their flag in Kamehameha’s kingdom after defeating the United States Army. This explains why the current flag has designs borrowed from the designs of flags from the two countries. Nevertheless, in 1816 the king went ahead and designed his own flag upon the advice of leaders of the Royal Hawaii army. Some of the people believed to have been instrumental in coming up with the flag were Captain Alexander Adams and George Charles Beckley. The flag was used for the first time in 1817 on a trading voyage in China by Captain Alexander Adams. Though there are no records on the exact order of the colors of the stripes of the initial flag, it is believed that it was based on the stripes on the past flags of the United Kingdom. In 1990, a day to celebrate the flag was set by the Governor of the State of Hawaii. 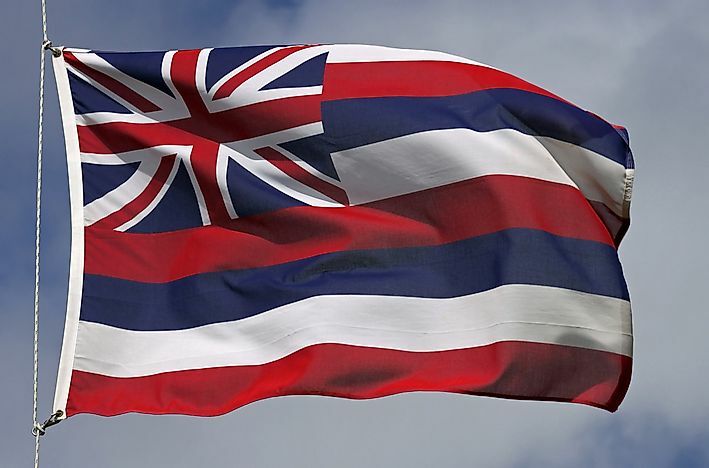 July 31 is declared a holiday in the state of Hawaii to celebrate the state’s flag in conjunction with celebrating the day of Restoring the Sovereignty of the state. The flag is also raised during national events and displayed in all government offices. It also hoisted on the ship during voyages. This page was last updated on March 2, 2018. Is Hawaii Bordered By Any US State? Is Hawaii a Part of Oceania or North America?